[Ottawa – December 23, 2014] In our final poll of 2014 the Liberals have rebounded somewhat to open up a small but significant four-point lead. This ensures that the Liberals will complete the year with never once surrendering the lead and in a position which nearly doubles their disastrous outing in 2011. While the Conservatives have drawn into a very competitive position the bounce that they received from the security episodes of the late fall appears to be fading. 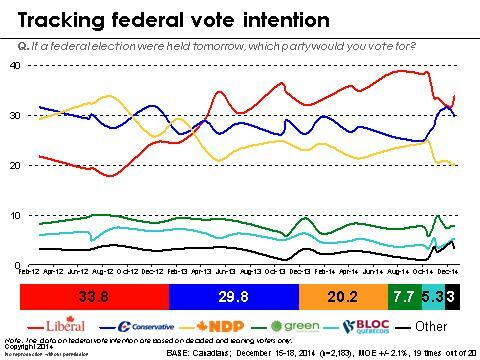 The next few months of what will be an increasingly intense pre-campaign period will tell us whether the CPC surge was ephemeral or structural. While nothing is clear at this stage it may well be that the CPC improvements are running back into the structural challenges that they were facing in the late fall. These surrounded a growing values disconnection with Canadians, a deep sense of foreboding about the end of progress and middle class decline and a growing regime fatigue linked to deep concerns about democracy and the role of the state and public institutions. The still developing political landscape may be reversing the shifts that saw the Liberals in a virtual tie with the Harper Conservatives two polls back. 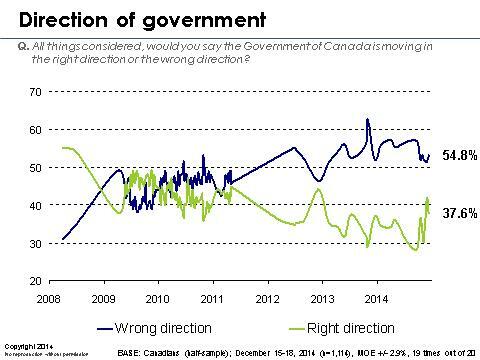 But the CPC rise seems to have halted as has the CPC slide. 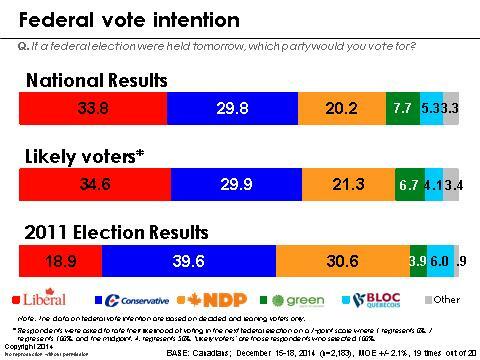 Notably, the NDP have faded and are now very much the third party in what is increasingly a two horse race. The regional patterns are fairly stable but the two key regions to watch are Ontario and Quebec. Ontario, which will determine who wins in 2015 is unclear but now leaning Liberal once again, with the NDP really out of the picture. The CPC surge in Ontario has seen them much more competitive but this seems to have stalled and the LPC are opening up a little ground. They are doing very well in Metro but also have rebounded in the 905. The East and Southwest are more challenging. Quebec is a newly completive four-way race with the CPC rebounding from single digits to respectability. The NDP and LPC are virtually tied with the BQ back at a very surprising 24 points. Let’s basically dismiss this as an unreflected anti-federalist vote that is temporarily looking at a poorly resourced party with neither machinery nor resources and a very poorly rated and poorly known new leader. This vote is more likely to return to the NDP so their strength in Quebec may be understated. The Atlantic region is remarkably committed to Justin Trudeau’s Liberals and has been for some time. British Columbia is a tight and unpredictable four-way race with the Green Party showing continued strength there. The 2011 Conservative Constituency is reassembling, but are there enough? The most notable feature of the charts above is the reassembly of the core Conservative constituency of 2011. This is an important achievement for the CPC as much of the 2011 vote had become a diaspora to Liberal territory. We now find the CPC base is the familiar older, less educated, male dominated base that underpinned its success in 2011, with the until recently missing immigrant vote also returning. Unfortunately for the Tories, there just aren’t enough of them to produce a government at this time and the most recent trends suggest that the Liberals may be rebounding. The chart above shows the way voters emotionally perceive the leaders, which is we believe, an important ingredient of both how and whether one votes. 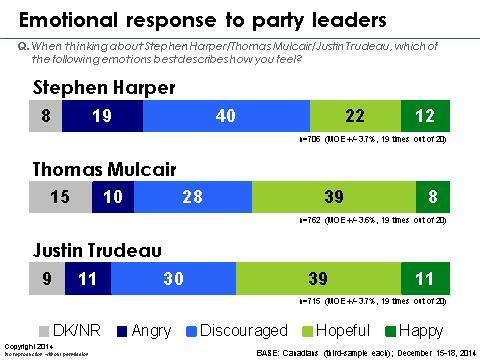 Justin Trudeau and Tom Mulcair are pretty well emotionally twinned in the voters’ minds (hearts?) but they have a clear lean to positive emotions. 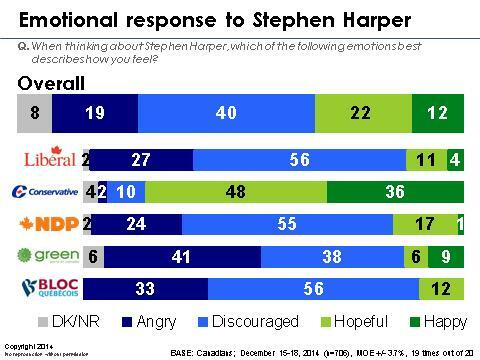 Harper produces much more negative emotions and this becomes more meaningful when broken down by constituencies. 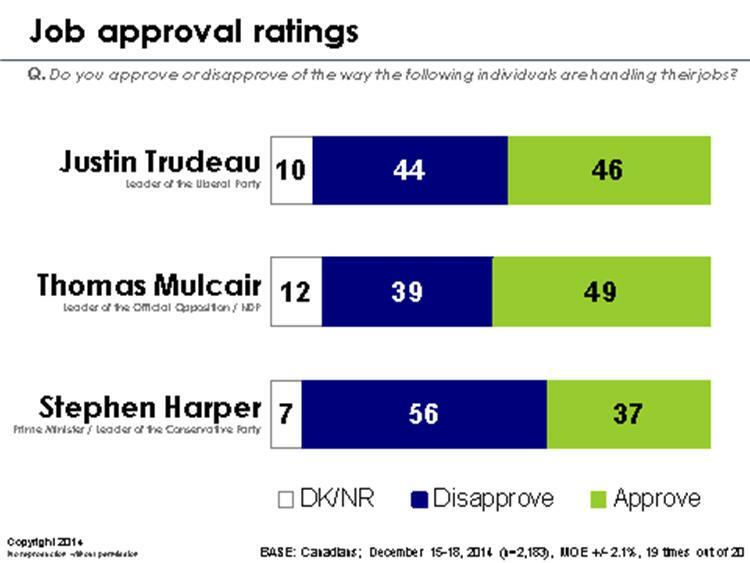 Perhaps the most disturbing finding for opposition pretenders to Stephen Harper’s crown is the much greater incidence of discouraged rather than angry outlook on the PM amongst their supporters. Strong emotions – positive or negative – produce engagement and alter voting behaviour. Weak emotions such as being discouraged do not. The critical challenge for opposition leaders and parties will be to either increase and strengthen their strong positive emotional connections (hope and happiness) and/or channel some of the more insipid discouraged outlook on Harper to anger. 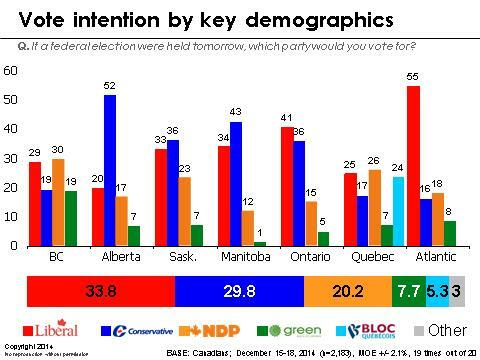 One notable qualifier to this observation is that measures of intensity of commitment to vote suggest that LPC and NDP voters are just as likely to be certain voters this time around as CPC voters. This is a critical difference which reinforces the challenge confronting PMSH. The progressive vote says they are definitely showing up this tme, it just isn’t clear which progressive option or hybrid they will favour. 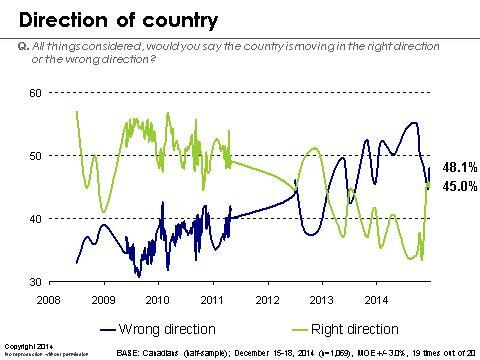 The recent time series on this indicator shows that just as with overall approval, PMSH has improved his perceptions with the public. Anger is going down, and being largely channeled into a more discouraged outlook, which is very good for his prospects. In order to win the Liberals need to reverse this trend and/or pick up their positive connections which are actually moving in the wrong direction recently. Some indicators suggest that they may well be able to do so. The NDP have a very similar problem but more so as they have lost pace with the leaders in an increasingly two horse race. On one of two forced-choice tests the economy (jobs and growth) ties social issues (like health and education) as top choice. For men, Ontario residents and Conservative supporters this is the critical issue by a wide margin. Here we may see one relatively hidden structural factor working for PMSH. The fears of job loss tracking are showing the lowest fears since the beginning of the century. Jobs may not be great, and economic outlook may be really crappy (it is) but those with jobs may be loath to risk an economic adventure with a new government at this time. 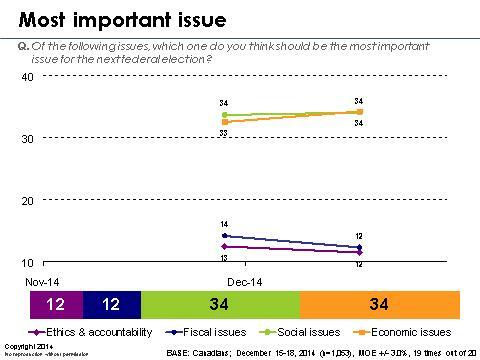 Women, Quebecers, and union members are much more likely to see social issues as the most important issues for the next election. These cleavages pose considerable challenges for the parties to try and blend some policy architecture that captures the optimal equilibrium of voter attraction across these different choices. One area that doesn’t pose such tensions are fiscal issues such as taxes and debt which are, by far, the preoccupation of the CPC voter. An alternate variation of most important issue shows a complementary picture with some interesting differences. Under this choice challenge it is the issue of middle class progress, which is the most important forced choice issue. This may be a ‘phony crisis’ in the minds of the right wing commentariat but it is a critical issue for voters. This captures the concerns most of Liberal supporters but it is of concern across the spectrum. 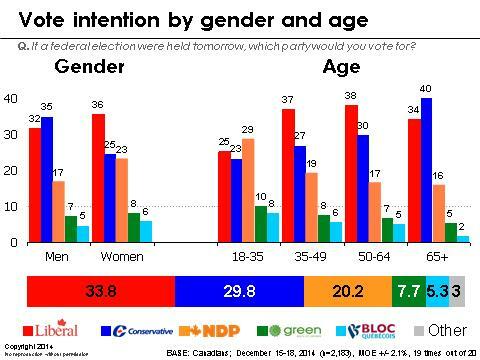 It is really important in Quebec and amongst younger voters but we believe the most compelling answer to how to solve this problem will determine who wins Election 42. 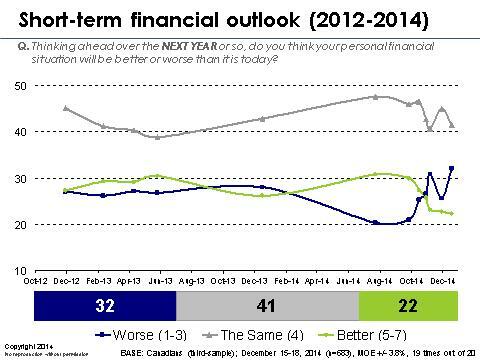 Only a scant 22 per cent and 29 per cent respectively are optimistic about the next year and five-year periods. As we saw, there may be some comfort in the belief that I am not about to lose my job but the overwhelming sentiment is one of stagnation and decline. 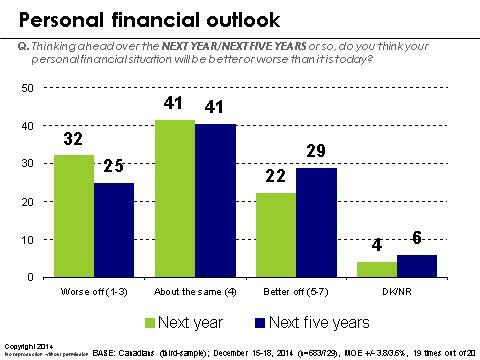 Despite the governments’ happy talk about the economy it rings false with voters, particularly those outside of the CPC base (who feel somewhat better about the economy). It is highly doubtful that the economy can change in a fashion that will dispel these gloomy sentiments. The notion that the government can run on its economic record is increasingly a sketchy proposition and their recent uptick has little do with a more buoyant outlook on the economy and really is being driven by heightened fears about security and a somewhat more benign outlook on the Prime Minister. The trend lines don’t augur well for any imminent turnaround in public outlook on the economy. 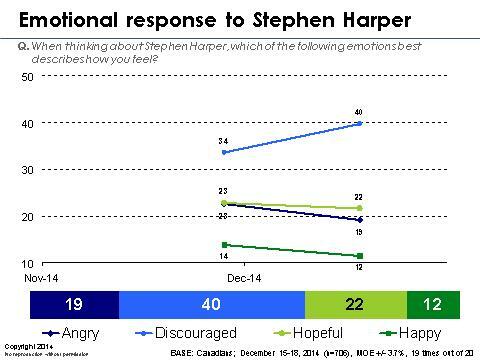 This may have the CPC thinking hard about an early rendezvous with the polls, despite protestations otherwise. So, gloom is high and rising as we enter an election year; never a promising thing for an incumbent government on the tail end of a nine year tour of duty. 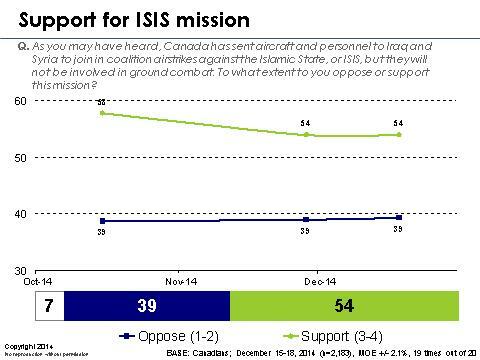 Finally, the government’s rare hit with mainstream public opinion on the ISIS mission remains intact. But prior examples of intervention in the Greater Middle East have witnessed a serious souring of public outlook as time goes on. We doubt that this one will be any different and we already see that there is a mild downward pattern to support. The fact that the Australian event, which coincided with the field dates, did nothing to move the concern levels up, suggests this declining pattern may well continue and accelerate. This should not happen any time soon but it would, once again, cause the political calculus to favour at least a look at an earlier date when this favourable force is still in play. The field dates for this survey are December 15-18, 2014. 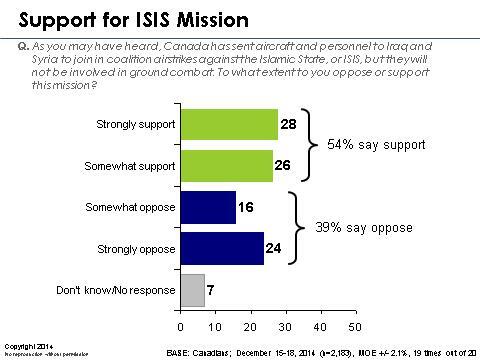 In total, a random sample of 2,183 Canadian adults aged 18 and over responded to the survey. The margin of error associated with the total sample is +/-1.7 percentage points, 19 times out of 20. 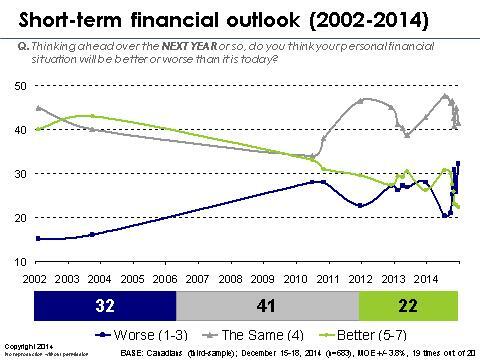 1 comment to Final Update 2014: Harper’s late year bubble may have burst? Could it be possible to access the tables of this survey? (for approval rate) Thank you!